Grand Central turns 100 in 2013 and the New York Transit Museum is starting the party early with its 11th Annual Holiday train Show! In a brand new layout built by Lionel, model Metro-North and New York Central trains depart from a miniature GCT on a 34′ long two level "O" gauge layout. Vintage model trains from the Museum’s collection and New York Central Railroad posters from the 1920s – 1940s are also on display. 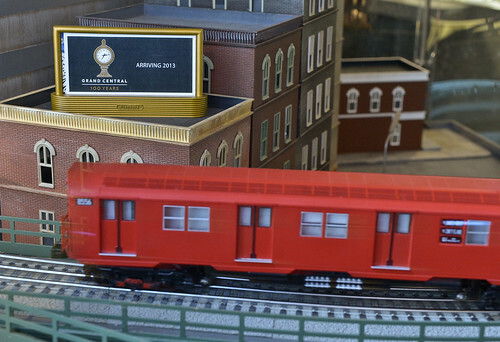 The show, at the Transit Museum’s annex at Grand Central, runs from November 21, 2012, through February 10, 2013. Photo: Metropolitan Transportation Authority / Patrick Cashin. The “Toy Train Expo” is an annual community event held during a holiday weekend, in the historic Victorian Park Place building in Williamsport, Pennsylvania. Model trains of all sizes are set up and operated, the purpose being to allow the public to see a lot of different trains they would not other be able to see without driving a long distance. Unlike most train shows, there are NO sales tables. The entire exhibit is 95% percent operating displays, plus about 5% static displays. The proceeds from the admission donation, are donated to the Preservation Williamsport organization. ~~~ All footage in this web video (with the exception of about 20 seconds) was originally RECORDED by Bruce Huffman — and is excerpted with his permission, from his 2-hour DVD showing the 2001, 2003, 2005, 2006, and 2007 shows. ~~~~~~~~ LINKS: * Pt. 1/3: youtube.com – This shows scenes mainly from 2007 displays * Pt. 2/3: (this video) – This shows scenes from 2007, 2006, 2005, & 2003 displays. * Pt. 3/3: youtube.com – This shows scenes mainly from 2003 & 2001 displays. At the end, there is also a 3 minute talk by the founder of this show, Will Huffman. * ToyTrainExpo.org – official Toy Train Expo website. * http – Preservation Williamsport website. ~~~~~~~~ All video used was originally RECORDED by Bruce Huffman. This video was assembled 11/03/2009 by James R. Ingram (aka Track2.com, aka RailVideos.org, aka JamesRobertIngram.com).